Tory Burch Crossbody: I've always been obsessed with bigger tote bags, but this summer I've been gravitating more and more toward smaller shoulder bags and crossbodies. I still love my totes, but something about a smaller bag is just so much easier in the summer time! I love this shade of pink in the new collection from Tory Burch and how it's perfect for all seasons - super transitional which makes the price worth it. Jewelry Organizer: if you're traveling, you need this in your life! I got this on sale for my trip last week and it's been a life saver for organizing and packing jewelry. The size is great too for travel! It fits in my carry on easily and it's pretty compact which is great. MAC Highlight Powder: highlighters and bronzers have been my obsessions for the past two months! I love the way they look when I'm tan and lately it's been selfie central because of this powder! It's gorgeous and shimmery and the price is great! Statement Earrings: Beaded Bracelet: who doesn't love a bright colored, summer arm party?! This beaded beauty is stretchy and comfy and doesn't bother me in the heat like other bracelets do. Pink RayBans: I haven't worn my pink RayBans nearly as much as I thought I would of since I bought them earlier this year, but I've been obsessing over them this summer! The color is gorgeous and if you're in the market for some new, fun sunnies - grab these!!! The pink are hard to come by these days! Workout Top: the Express workout collection is THE best. I've been trying to workout more and if I'm going to work out I need to be comfy! I love this top and all of the colors it comes in! X Ring: how pretty is this?! I tried this on in-store a few weeks ago, and it's on my wishlist. Crochet Sunhat: I wear these fun hats all summer long and I found this crochet hat so much fun. It's different than any I've seen, it's on sale for $15 too! Naked Highlight Powder: another powder because I have a serious obsession! This one is just as good as the MAC powder and it's gorgeous on your skin. Flamingo Float: you probably saw this float on my Instagram a few weeks ago, it is my favorite!! I love how cute it is; it makes for great pictures and it's comfy to float on in the pool! Gold Drop Earrings: PSA - these are $6!!! AND super light weight! I love them and I've already worn them twice (I got them three days ago in the mail)! Patterned Makeup Bag: as if I need another makeup bag! But this pattern is so cute and there's a ton of sizes in this pattern, it's so pretty and great quality if you're in the market for a new one! Essie 'Cab-ana': this color and Fiji have been on repeat all summer so far. It's gorgeous on and the perfect summer shade! My early access favorites are here Fun home decor pieces a part of the sale are linked here Here are my shopping tips for the sale and more of my favorites, including things that are priced the best during the sale! My favorite beauty products are here and I also shared how they double as great gift ideas. There are so many of your cravings that I want too! I really need (want) the TB crossbody, the jewelry organizer, and the flamingo! I love all of it but especially those flats and the workout top. I have this obsession with pointed toe flats! I love those SE flats...and want them in just about every color! So. CUTE. oh that work out top, so pretty!! Gosh, have a blast in Italy!! I am so happy you get to go to Italy I only wish I was going with you..ha! That pool float is dreamy..i so want one and all your picks are amazing! Have a great day! Great picks- I am dying to get a swan float for our new pool! Oh, my GOD! Those. Earrings. Pure beauty! I'm dreaming about having a couple of Essie nails polishes, and I think I just found one I must have. These are great picks! I've been eyeing that Mara Hoffman makeup bag. Such a gorgeous print! I really appreciate your taste when it comes to fashion! I love everything that you have on the list, it's definitely something that I would go for too. Okay so I'm officially ALSO craving every single thing you've posted on this list. Those are some nice products. I really love the sunglasses. They're really nice. I also love that flamingo floatie. That's cute! Love all the items and the workout clothes! Enjoy Italy! Those flamingo floats seriously do make the best pictures! And there's nothing better than floating around a pool. I'm with ya! August is my favorite month because it's my bday month. I'm already stock piling all the bday discounts I've been getting. Can' wait to buy something fabulous. These are such cute items, I love love that flamingo! 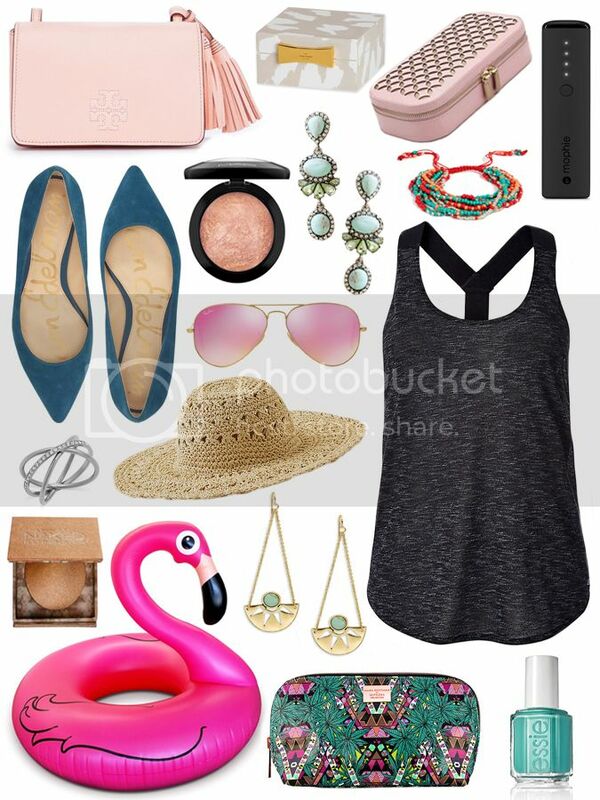 The pretty pink purse and the flamingo float are my favorite items pictured here. Lots of cute stuff to choose from. 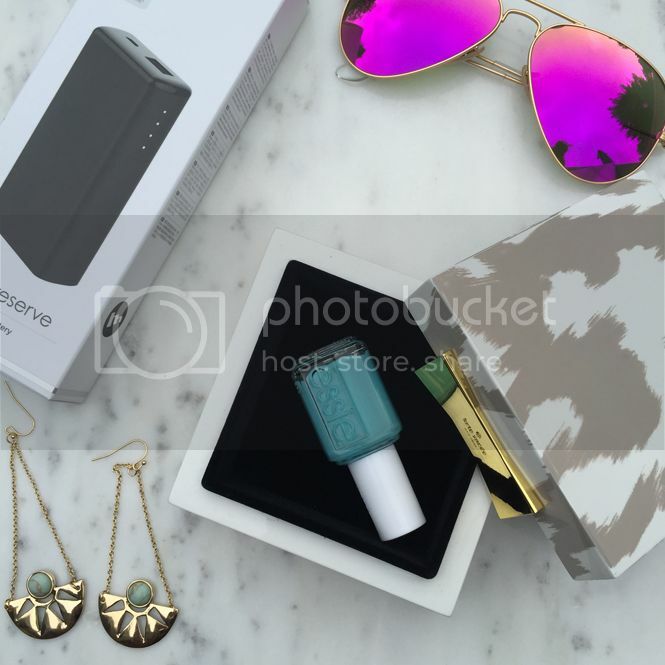 Great summer picks! I've been dying to get those pink ray bans! Their such an easy way to add a statement to any outfit! That Essie color is soo pretty! Wow, I like these items! That pink pouch is very sassy. The flamingo is so cute! I love the TB crossbody! Its so fun and the perfect color! I have been obsessing over the Ray Bans in pink and blue but I haven't been able to pick one yet so I haven't purchased them. Love all your picks!! Loving all of your picks especially those sunnies. LOVE that flamingo float! I have an external iPhone battery as well and it's the best thing ever! Loving those pink ray bans I have been thinking about getting them recently. I love the pink raybans! These are so nice and really pretty! That Tory crossbody is absolutely beautiful! I love your float :) I'm going to be so sad when I have to put mine away until next summer. Oh, this reminds me so much of our wonderful summer. It would be so nice to wear the pink rayban and float on that cute flamingo. remember, that pool float is good all year round! the perfect decor! ha! I love those purple sunglasses! They're definitely something I would wear! I'm kinda lovin' on those earrings. I love to wear statement, chunky ones like that! I am in major need of some new flats!! Love the ones you picked out! Great products! I LOVE that Tory Burch bag! We don't have a Nordstrom around here to check out. That's too bad because it looks like they have a ton of cool stuff. Those pink ray bans are so awesome! I love them and would definitely rock them everywhere. Girl@ Good call with the Sam Edelman flats. I'm obsessed. That highlighter from MAC looks so good too. Might have to get that! Sounds like you had a wonderful July & mine was a bit perfect too despite few ups & downs here & there. Your favorites are amazing & I love those earrings & that gorgeous Beaded Bracelet & those glasses from RayBans! Those are some cute cravings! I am now all about phone cases since I just got a new phone and want it to express my personality. I love those flats, that blue color is gorgeous!